We'll continue on in our journey through the great book of Revelation by getting our teachers back together to continue discussing Chapters 13-19. Feel free to watch, listen, or read along by clicking one of the icons below. 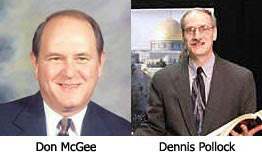 Don McGee: I don't think so at all. The United States does not fit the profile that we have here in Chapter 17 for several reasons. I personally believe that this is a religious system that John in talking about here, and though the United States is a great nation and has a lot of influence, we don't know what that influence will be like during this time. But, even if the U.S. would be a powerful and great nation during this time, it would not be the religious system that John is seeing here. Dr. Reagan: Basically, what we have here is a religious system in Chapter 17, but we have a political economic system in Chapter 18. The two are welded together so that we've got all three. We've got political, economic, and religious systems that are dominating the world. I think the reason so many people point to the U.S. in these passages is because they look at the world scene right now and they say, "Well, there's one superpower and that superpower is the United States of America, so this must be talking about the United States of America." But, folks, this is talking about the end of the Tribulation, and during the end of the Tribulation we're talking about the worldwide kingdom of the Antichrist. His kingdom is the one that is going to dominate the world as no other kingdom ever has, because as we saw just a few moments ago in Revelation 13, he's going to control every kingdom, every nation, every tribe on planet Earth. This is something people have dreamed about for years, but have never accomplished. That's who is being talked about here. I don't think Mystery Babylon is the United States. A superpower that's rising in Europe right now that's already eclipsed the U.S. in terms of numbers, economic power, and everything else is the European Union. Dennis Pollock: I think there's a certain arrogance among many Americans that says we've got to be there somewhere. And so, they're looking here in Revelation and there and beyond, but it just doesn't fit. Dr. Reagan: Over in Chapter 19, Jesus is portrayed there very, very dramatically and very vividly as returning in great wrath, pouring out the wrath of God upon the earth. In fact, in some places we're told that when He comes His wrath will be so great that the presidents, the prime ministers, the leaders of the world will all crawl into holes in the ground and cry out for the rocks and mountains to fall upon them. How do you reconcile this image of Jesus as a fierce warrior returning to pour out the wrath of God? How do you reconcile that with the image that we hear in church all the time of the compassionate, loving Savior? Another facet equally important as love is the one that we call justice, and one of these days He is going to demonstrate that part or that facet of His character when He pours out His wrath on this world. It's not going to be like you or me getting angry at someone and pouring out wrath upon them because sometimes as humans it's unjustified or it's too much or something like that. Not so here. This is a fierce wrath and it's a justified, righteous indignation that God is going to pour out upon this earth which makes His wrath a lot different from ours. Dennis Pollock: I hear people asking questions like, "How do you reconcile God's love with this idea of His wrath?" I'm reminded of what Spurgeon once said, "You don't need to reconcile two friends." Dennis, how can a person be assured that they will receive an invitation to that heavenly feast where they'll be the guest and not to this earthly feast where they'll be the meal? Dennis Pollock: This is a party that you don't want to miss. It's the banquet of all banquets, and the feast of all feasts. It's a gathering of all those who have served Christ for the last 2,000 years. John Wesley will be there, Charles Spurgeon, D. L. Moody, Charles Finney, and millions of more ordinary Christians as well. But, the most important figure at this banquet is going to be the host — the Lord Jesus Christ Himself. There's a saying in this world that goes, "It's all in who you know." And, that's pretty much true here. To receive an invitation to that great wedding feast of Jesus, you have to know the Bridegroom personally. You have to know Jesus, not know about Him and not merely be able to recite the main facts of His life, but know Him personally as a result of being born again. So, how do you get to know Him? You invite Him into your life. Jesus is such a gentlemen that He will never come into your life without your invitation. He knocks at the door, He speaks to your heart, but you have to invite Him in. That's why the Bible says, "to as many as received Him, to them He gave the right to become the children of God." Receive Christ as your Savior. Invite Him into your life today. He's waiting for you. Dr. Reagan: There's also a message for believers in these chapters of Revelation. It is summed up in the call to come out of Babylon. Don, what in the world does that command mean in practical terms? Don McGee: I think it's a call for believers to separate themselves from the world, not in the sense of going into hiding or living a monastic life, but in rejecting the standards of the world. We are to be in this world, but not of this world. We are called to interact with people of this world, but we're also called to reject the standards and the values of the world. We're to be salt and light, standing for righteousness. We're to be ambassadors for Christ, but we are to keep in mind that this world is not our home, we're passing through. We're aliens in route to our eternal home with God. In the process, we need to be constantly checking to see if Jesus is really Lord of everything in our lives. Is He Lord of our music? Is He Lord of our television, our movies, our jobs, our money. That's what holiness means in practical terms. In the next part on this series on Revelation, we'll get a glimpse into life living in Christ's Millennial Kingdom and rejoice at the final end of evil in Revelation 20. 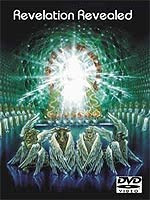 Dr. Reagan says, "... in Revelation 13, he's going to control every kingdom, every nation, every tribe on planet Earth." Moreover, if the Antichrist controls every kingdom and nation, then why are other nations waging war against him and why is he himself waging wars (Dan 11:39-45; 9:26)? How can even one nation -- for example Jordan - escape his hand (Dan 11:41)? And why is he so worried about news coming out of the east and the north (Dan 11:44)? If Antichrist were to control the literal planet he would not be having these problems. Rev 19:7 declares that the marriage of the Lamb is come "and his bride has made herself ready." In Rev 21:9-12 we read, "And there came unto me one of the seven angels... saying, come hither, and I will shew thee the bride, the lamb's wife. And he ... shewed me that great city, the holy Jerusalem ... which had a wall great and high, and twelve gates... and names written thereon which are the names of the twelve tribes of Israel." According to Revelation 21, is the bride of Christ the New Testament Church, or is it Israel? Yawwwnn! zzzz - Oh Mitchell, honestly, IF you will insist on another brand new form of 'progessive' interpretation, in spite of evidence to the contrary, you are bound to come up with yet another quirky notion - bless your heart, God love ya! -Limbuger - "Once it reaches three months, the cheese produces its notorious smell because the bacterium used to ferment Limburger cheese and other rind-washed cheeses is Brevibacterium linens, the same one found on human skin that is partially responsible for body odor. She hollers at him thru the door "Yer drunk again!" - "No, Honey, I'm not, I swear!" - "I don't believe you...let me smell your breath. Put your mouth on the keyhole and blow..."
Read my replies, you might learn something. :) See here.